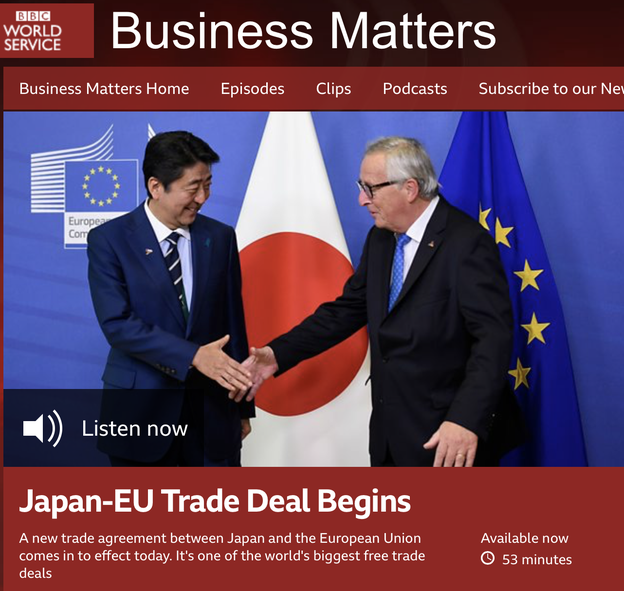 Our Managing Director Masako Eguchi-Bacon was interviewed by the BBC to share her view and expertise and the interview was broadcasted on the “BBC Business Matters” programme on the 1st February. Under the EU-Japan EPA, about 30% of global GDP has become a free trade zone. Another important fact is that common rules including intellectual property and data distribution were established under this agreement, which will influence global standards and regulations. These will certainly strengthen the tie between the EU and Japan and encourage both trade and investment. When it comes to export, currently the top items from the EU to Japan are Automotive and Pharmaceutical, and we expect growth in these categories. Considering the strong interests from Japanese consumers, European foods, wine, clothes and shoes will be increased. From Japan to the EU, the most exported item has been Automotive and this is expected to increase. As Japanese foods are getting more popular in the EU, the export of Japanese foods such as green tea, soy sauce and beef is expected to increase. Whilst many Japanese companies look to the US and Asian countries as their overseas destinations, there are a growing number of Japanese companies which show a strong interest in the EU, however, they find it difficult to identify opportunities. For such companies, the EU-Japan EPA will certainly open the door. As an example of our support in developing business opportunities between EU and Japan, the interviewer mentioned the regional tie between the Thames Valley (UK) and Kansai, which OBM heled establishing with Thames Valley Chamber of Commerce, Osaka Chamber of Commerce, along with the UK and Japanese government, enterprise and academia. We could establish an ecosystem and start creating business opportunities. In face of Brexit, will the UK lose out? Our answer is Yes and No. Yes: - because of the uncertainly, many companies have lost confidence and they may choose other EU countries as a destination for trade and investment. No: - Even if the UK will completely exit from the EU (and if the UK can negotiate independently with other countries), we believe the UK and Japan will reach a similar agreement to the EU-Japan EPA. The relationship between the two countries is getting closer, and they already agree to the free trade principles.